Diarrhea and constipation are common conditions, particularly among babies who are making the transition from breast milk or formula to solid foods. Most cases are mild and respond to home treatment methods, according to the Baby Center website. Applesauce is an easy-to-digest baby food that may alleviate symptoms of both diarrhea and constipation. 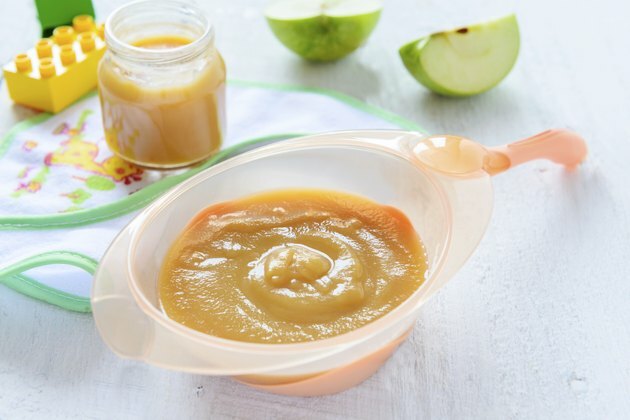 Talk with your pediatrician to determine if applesauce is an appropriate choice for your baby. Applesauce is considered a binding food, which means that it helps firm your baby's feces. This makes it an effective choice for a bout of diarrhea. Pectin, a type of fiber present in apples, induces a bowel movement in a baby who suffers from constipation. For both conditions, applesauce is easy to digest, making it an ideal choice for babies whose digestive systems are still developing. You don't have to reduce the amount of applesauce you feed your baby when he has diarrhea. Dr. Sears, pediatrician and author of "The Baby Book," recommends serving your baby half as much, twice as often. Offer your baby a couple of spoonfuls of applesauce every two to three hours. For constipation, serving consistent amounts of applesauce along with other high-fiber foods, at regular intervals, helps regulate bowel function and ease constipation. If your baby has diarrhea, combine applesauce with other binding foods, which include toast, rice, bananas and yogurt. These items offer your baby a range of nutrients and help relieve digestive disturbances. Include fluids with your baby's meals when he has diarrhea to prevent dehydration. For a constipation diet, offer applesauce alongside other foods that contain fiber. Good choices include whole-wheat bread, vegetables and other types of fruit. Fluids are also important for softening your baby's stool, allowing him to pass it through his intestines and out of his body. If your baby is under 4 months of age, applesauce is not an appropriate choice. Babies this young are typically able to tolerate breast milk or formula only. If your baby has never had applesauce, avoid serving it with other new foods. This allows you to determine the cause if he shows signs of a food allergy. Most cases of diarrhea or constipation are safe to treat at home, but some instances require a call to your baby's pediatrician. Bloody diarrhea, stomach pain, weight loss and dehydration are conditions that may require medical intervention. The Baby Book; William Sears M.D. and Martha Sears, R.N.